Premium fuel: yes or no? This was the sight that greeted me at the gas pump today when I filled up a vehicle. Fortunately, my ride called for 87 octane, which was "only" $1.25 per litre. 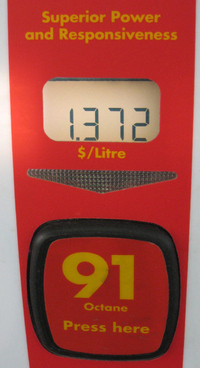 The premium stuff represented a jump of 12 cents a litre. That would have added about eight bucks to my total. The Internet's awash in articles on whether most cars really need premium. Few will come out and actually say you can run the lower-grade stuff, liability being what it is, but the general consensus seems to be that if it isn't turbo- or supercharged, the lower grade should see you through. Things were different way back when, before cars had computerized fuel management systems and knock sensors, and using a lower grade could damage a higher-performance engine. Today's cars can make up the difference by dialing back a little, which shouldn't be too much of an issue to the average driver. I don't know about you, but I doubt I'd be able to tell if my car was producing 300 horsepower instead of 302. I have another unproven pet theory, and it has to do with prestige and image. Many of the premium-brand manufacturers call for high-test across their entire product lines, regardless of engine size or horsepower. Call me a conspiracy theorist if you will, but I wonder if the thinking is that premium fuel = premium car ... and a car that takes "regular" fuel is, well, just a regular vehicle. In other words, it ain't the car that needs the expensive fuel, but the owner's ego.